Raf Custers, journalist, researcher and raw materials specialist at Gresea.be in Brussels, published Grondstoffenjagers (EPO, Antwerp 2013 - French translation: Chasseurs de matières premières / Hunters of raw materials). A new book on ‘raw materials democracy’ in South America will be out this autumn. Shortly after publishing Grondstoffenjagers (Hunters of Raw Materials) early in 2013, I started to prepare for a study trip to South America, to check the outcomes of Grondstoffenjagers. In this book, I strongly emphasize that extractive industries are built on the enclave model: zones of extraction of oil, gas or minerals that are cut off from the surrounding economy. Enclaves exist without real linkages, they are not embedded in the local or national economy. They exist to extract and export; they import the machinery, and personnel, and they export raw materials, revenues and profit. The operators of these enclaves leave the countries impoverished: they get away with the non-renewable minerals and, I repeat, with the money. On May 22 I heard Professor Stefaan Marysse from Antwerp University on the extractive industry of the Democratic Republic of Congo, and this industry does exactly that: the DRC’s Gross Domestic Product grows around 10% a year now, but it is essentially the foreign mining companies that are thriving and repatriating gains. So this was what I wanted to look at in South America. We were travelling comfortably with our own little Volkswagen combi. For months everything went fine. People asked us: are you not afraid? Of the narcotraficantes? Or murderers in remote areas ? But everything went fine. The only threat we encountered, came not from violent criminals, it came from a couple of birds, Kero Kero’s, on the beach in Trinidad on the Brazilian coast. Kero Kero’s walk on long legs, they are stiltwalkers and this couple attacked us, diving over our heads with loud shrieks, because we came too close to their nest. Two months later in Argentina, a real thief broke a side window of our van and got away with a laptop and a camera. Another two months later in Chile we got a new window. It was made in a small industrial workshop, that still uses artisanal methods, from raw glass in a big oven, and the window was a masterpiece, it had the precise shape and size of the original window. And so, there you have this couple of Kero Kero’s, a species belonging to Brazilian biodiversity, you have the theft of our equipment in a show of Argentinian ‘share economy’, and Chilean ‘circular economy’ that made us a new window out of almost nothing. These and many other experiences will find their way into a new book, a follow up to Grondstoffenjagers, which will be out in October of this year. I strongly believe in the Circular Economy. Collecting and recycling is as old as mankind [it is probably the second oldest profession that we know of], and it has always been an activity of the poor. I once saw a spectacular exhibition in Hong Kong about the Sixties on mainland China: poverty was immense then, nothing was thrown away. Clothes were repaired again and again, shoes were transformed endlessly until they became like precious objects, the little that people had was being reused and remade, this is the Circular Economy in its essence. I see the Circular Economy happening in the big cities. I see it in Johannesburg, I see it in Kinshasa, I see it under my window in the center of Brussels. Walk around in Buenos Aires after office hours, and you’ll meet the paper and cardboard collectors piling up and carrying away their treasures. 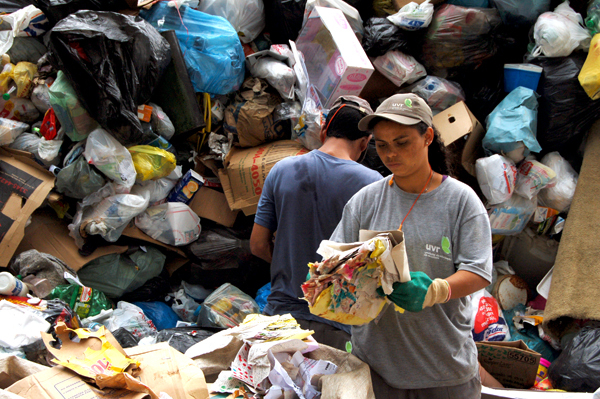 The Circular Economy is a business of the poor, organizing themselves, often into cooperatives. And now that it is becoming Big Business, we should take care that the Circular Economy stays in the hands of the people. 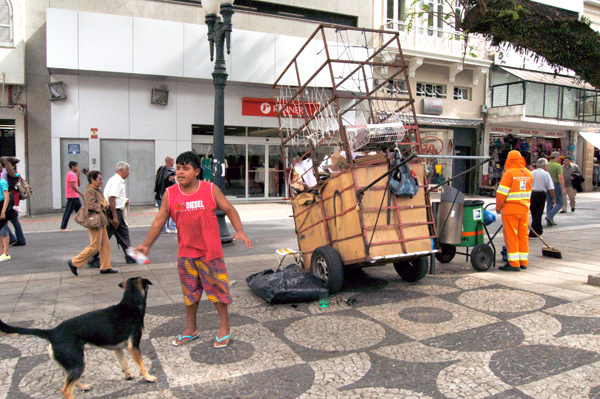 In Curitiba in South Brazil, it is the municipality that manages the collection of waste, but the city does so in partnership with cooperatives of the poor. Curitiba is advanced in many ways. This city invented a public transport system that has been copied by many other metropoles around the world: a system of docking stations that gives priority to the buses - owned, managed and run by the public authority, for the sake of commuters and users, to diminish the presence of King Car, to diminish the pollution that cars inevitably pump into the cities, and to make Curitiba a better place. This is certainly one of the lessons that I’ve learned in South America. The Circular Economy should be a PPP, it should be a public-public partnership. Crises are often presented as opportunities. I am a very sceptic about this slogan. But, if we have a raw materials crisis on hand, then we should grab this opportunity to shape the Circular Economy and the Raw Materials policy around public-public partnerships. The public sector must not retreat from the economy. It must regain its central and pivotal role and be an active economic agent. Not only in collecting and recycling, but also in other sectors, such as Mobility and Transportation, Telecom and Energy. This is the first important part of Sustainable Development as I see it. Now as a matter of fact: there are many P’s in my story. I mentioned the PPP’s from the Public Private Partnership in the Circular Economy. Now we’ll have the P’s from Sustainable Development. Traditionally, Sustainable Development is defined along three policy lines: there’s the social element, there are the environment and nature and there’s the economy or in other words: profitability, which gives the three traditional P’s : the People, the Planet and the Profit or, rather, the Re-Distribution of Profit. But, three P’s is a far too narrow view. We must take a multidimensional approach towards Sustainable Development. We must add another P, and count in the Time and Space dimensions. Sustainable Development will go nowhere if we only see our particular interest. In this way, what the European Union is doing is Unsustainable. In Grondstoffenjagers I analyzed the genesis of two major political initiatives: I analyzed how both the Conflict Minerals section of the Dodd-Frank Wall Street Act of the US and the Raw Materials Initiative of the EU came to be. In the Conflict Minerals section, it is the geopolitical strategy of the USA that prevails. In the Raw Materials Initiative it is the economic interests of the European industry and the European industry only that prevail. The Raw Materials Initiative was blue-mapped out by a Task Force of the metals industry of Germany and taken to the higher level of the European Commission, which adopted it as its policy in 2010-2011. But this is an egocentric and Eurocentric program. The Raw Materials Initiative seeks answers to the question: how can our industry survive? All the others may drop dead, but we must survive. Now, if others drop dead, it seems to me that there is hardly any sustainability in this initiative. So we have to give Sustainability a systemic twist. We have to count in the Time and Space dimensions. Sustainability for me is also about Time: it is about Now, and about Past and Future Generations. Sustainability also has to take Space into consideration: it is about Here and Elsewhere, Europe and the other parts of the world. These dimensions are missing in the Raw Materials Initiative. The EU surely travels into the global space, but only to find its own interest. The EU tried to impose the Economic Partnership Agreements on Africa, and Africa refused en bloc in 2007. The EU then made a tactical retreat, and started to negotiate bilateral agreements, with individual countries or regions in Africa and then South America. And now the EU is strengthening its historic alliance with the USA, to create the Transatlantic Trade and Investment Partnership which without any doubt will be and remain the strongest economic bloc on earth for the next decades. The TTIP wants to impose utterly Free Trade on all parts of the world. But again, this is overall un-sustainability. And all the more because the EU’s economic action is increasingly accompanied by military components. France is at the forefront of this tendency. France started to study its raw materials supply security shortly after Germany. Today France consistently combines economic diplomacy with military strategy and military intervention. This is old power politics. And in this sense the Transatlantic Trade and Investment Partnership (dubbed by some ‘the economic Nato’) is to become the apex of old power politics. So where do we go from here? Here I bring in my fourth P: it is the P of Politics, of decision making and of seeking the interests of the world’s nations and peoples. Let me remind you of a piece of international law from the post-independence era. From the 1950s onwards peoples that fought for liberation and independence voiced the aspiration to decide for themselves and chose the ways to progress that seemed most appropriate to them. This aspiration was evoked again and again. Bandung in 1955 was an important step, Bandung, sixty years ago. Then in 1962 the General Assembly of the UN adopted an important text, Resolution 1803. This Resolution recognizes the sovereignty of peoples and nations over their natural resources. Resolution 1803 gave these new nations an instrument to run their natural resources businesses. Many used the principle of the Resource Sovereignty to organize the extractive industries under the control of the state. These experiences are Sustainable Economic Zones avant la lettre, and here I refer to the idea of Sustainable Economic Zones advanced recently by the colleagues of the Rathenau Instituut. I suggest that we look at this interesting notion of Sustainable Economic Zones like this: as zones of sovereignty, not as new enclaves, not as corridors (or closed pipelines) where we are pulling economic strings. This was 1962 and we know that the pendulum has been swinging back and forth. From the late 1970s onwards, the industrial world acted against Resource Sovereignty. Our old world wants to keep things as they have been since colonial times: the Global South produces raw materials, the North uses and transforms them, adds value and makes profits out of them. But what has this brought us? It has brought us, as Jean Ziegler said, La haine de l’Occident, deep hatred for the West. I must say that I hardly ever personally encountered hatred in Africa or South America. But what I do encounter is the determination to progress according to sovereign policies. We as peoples in the industrialized world must respect this. This is also a matter of Shaping Politics in our countries. We must exert pressure on decision making by the political class and by the transnational corporations, in our part of the world, pressure to work with the Global South. We must exercise political democracy and put pressure on our political class to deal with the Global South as with equals and to seek mutual benefit. We must exercise economic democracy within the oligarchy of multinational and transnational corporations. It is they who are trading, it is these corporations and their intra-firm trade which make out the bulk (two thirds) of world trade. It is they who set the prices, they who decide on the capacity and the volumes produced by the extractive industries, it is they who over the last couple of years created overproduction in iron, oil, copper and cereals. And so finally we must pressure our political class to curtail the oligarchs that distort the world’s economy. If I add all this up, Sustainable Development has to be much broader than what we’ve heard so far: it has to consist of at least Seven P’s: People, Planet and Profit plus Politics in a Public-Public Partnership Perspective. That’s not seven P’s, that’s eight. Let’s get for it.